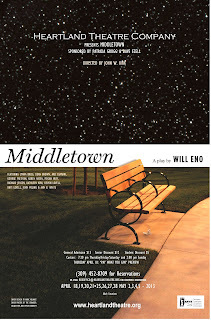 In a piece on Will Eno's Middletown earlier this year, Boston Globe critic Christopher Wallenberg called the play "a meditation on birth and death and the lives burning bright in between." Note "the lives burning bright in between." The characters living in Middletown tell us about birth and death all through this quirky, engaging play, as they muse on why they're here, what their places are in this world, and what their legacies might be. It's easy to fall under the spell of Eno's heady writing in all its poetic beauty. But don't miss the fact that he is also etching vivid portraits of a town's worth of people -- the librarian, the mechanic, the cop, the handyman, the newcomer, even the astronaut who once called Middletown home -- in heartbreaking, wonderful detail. These people are as quizzical, as amusing, as real as your neighbors, and yet not like your neighbors at all. It's to the credit of director John Kirk's current production for Heartland Theatre that each of those portraits comes across loud and clear. His actors, most of whom play multiple roles, have worked hard to come up with individuals who are different from each other, a little odd, a little awkward, and quite fascinating. Rhys Lovell and Karen Hazen are out front among the cast, both turning in terrific, layered performances. Lovell is always good, but his John Dodge, a man in between jobs, in between hobbies, living very much in the in between, is something very special. Dodge may be a bit of a mess -- well-meaning, but a mess -- but Lovell's performance is anything but. He's fantastic. And Hazen is just as subtle, just as amazing, opposite him as Mary Swanson, the newbie in town, the one who serves as our eyes on Middletown. Hazen's portrayal of Mary makes the character funny, sweet, and relatable, as Mary's yearning for something more, something more than a husband who is so often on the road, becomes clear. Kathleen Kirk's librarian and Dean Brown's "public speaker," who introduces the idiosyncratic tone of the piece, add quirky warmth to the tableau, while George Freeman's scary cop and Richard Jensen's scary (in a different way) ne'er-do-well mechanic bring harder edges into Middletown. Others in the cast who shine are Aric Diamani and Devon Lovell as doctors, John Poling as an astronaut high above the town, Lynna Briggs as a strange spectator, and Ann White and Megan Huff, who pair up as guide/tourist and hospital attendants. Your guidebook to Middletown is written right into the script. Pay attention to how many times the "great and unexamined middle," as Eno puts it, comes up. The middle, the intermission, the time between birth and death, waiting periods and in-between times... Or, you know, life. Eno has a unique voice in contemporary theater, just as Heartland Theatre has a unique place in our local theater scene. And what a good match they are. Remaining Performances: April 25-27 and May 2-4 at 7:30 pm and April 28 and May 5 at 2 pm. For show times, click here. For reservation information, click here.